For me, any time I decide to start picking back up training, it means that a certain time is spent having to plan out runs, make sure that I can juggle schedules, etc. It doesn’t have to be stressful and hectic. I’ll be entering my 7th marathon training in June and while it’s a bit easier for me to train through the summer (no work! ), I just finished training for marathon and Gasparilla just a few weeks ago. 1. Plan ahead as much as you can, but leave an “out” every week. Every Sunday, I plan my week out. I schedule my runs as if they are appointments. Fitting them in through the week around meetings, work commitments, home, etc. It’s like a giant puzzle. Once they are written down, I do my best to keep them. I leave myself a day or two each week which is my one mile “rest” day where in case things become disrupted, I switch my higher mileage days around. So far, it’s worked out. If you know that you can’t run 5 days a week, then don’t try to stick with a training plan that has that many days of running. Look for plans that fit into what you may be already doing, though the miles might kick up on the long runs. After having trained for 35+ half marathons now, I just make up my own plan. 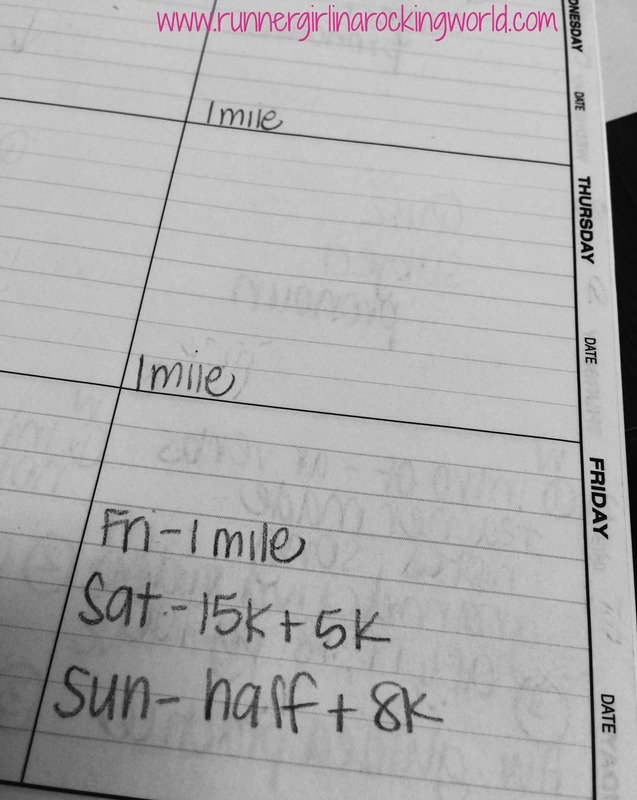 I look at previous plans and try to match the weekly miles. That leaves me some flexibility. If you aren’t at that point yet, scour the internet for plans. Hal Higdon, FURMAN First, Hanson, etc. all have plans sitting out there. I make plans to run with friends for 90% of my runs during the week. I find that it helps me stick to my plan, keeps me motivated, and makes running social vs a chore. We spend the time chatting and running, catching up with each other. If you don’t have a big pool of runner friends, look for local running meetups. A lot of the running stores offer a group run. 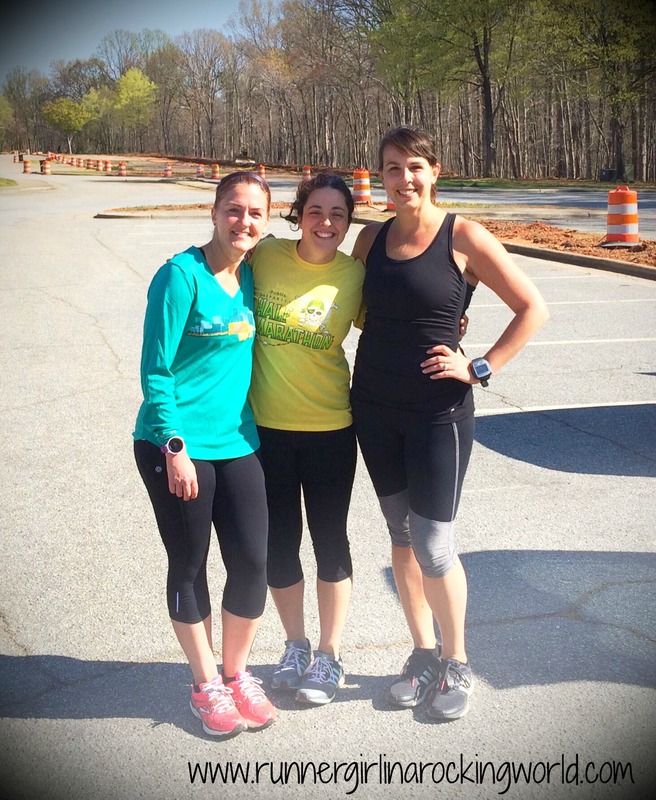 You may even find someone who is training too and can meet up for runs! By now, Nick knows that when I start looking at races, that means training is starting. He’s been amazingly supportive as I knew he would be, but I also make him part of the training and the decision. Share your goals and training plans with your family and friends. Once they see how important this is to you, they will be willing to help out and their support will go a long way! Nothing worse than feeling any kind of guilt when you head out to run. If everyone is in the know, then there is less room for resentment. Non-running friends will know that you haven’t fallen off the face of the Earth; you are just doing something that is really important to you. On days I know that I have meetings after school, I pack my running bag. If there is any way that we get out earlier than 5pm, I’m running. Mondays are my BodyPump days and I make sure I have my gym bag with me. By planning and prepping ahead, it may help you sneak a run in when you might not have thought otherwise. Several runners keep a full change of clothes and shoes in their cars at all times, just in case. There are going to be some times when life will throw a curveball at you and you miss a run. It’s okay. That’s why training plans are weeks and not days long. Regroup, don’t let it set you back and try to fit in the miles somewhere else. If you can’t, don’t sweat it! One run missed will not make or break your training. It won’t. I promise. During most of my marathon trainings, I’ve thrown in half marathons, 25K and 30K races. Why?! I’m running the miles already! I might as well get a medal and a tee for finishing a long run! It’s also a great way not to have to train again for one of those specific distances. I don’t race them. I run them at my training plan pace. It’s also a great way to break up the long training and long runs. It helps keep me motivated! Any tips or advice that you can share about time management? Share them with me! Looking for more running-related posts, check out Tuesdays on the Run by visiting Run the Great Wide Somewhere, MCM Mama Runs, and No Guilt Life. See what other runner’s are sharing! Love these!! Especially fond of #2 – we have to be able to name our own reality!! Sometimes I pick a training plan for the life I wish I had (one where somebody else does the housework and the grocery shopping and the working and the driving kids around;) instead of one that fits the life I actually have. Much better to have realistic expectations!! Great post!